This children’s book is exquisite from beginning to end, from front cover to back cover. I must also add that I love Chinese art and calligraphy, having attempted my own from time to time, so any book with Chinese art work steals my heart. However, to see a book like this suited for children, is a double delight. 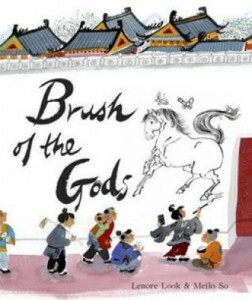 The story is an imaginative version of the life of the great Chinese artist Wu Daozi, taking us on a journey from his time as a young student to the very mysterious and magical ending of his life. Each page in this beautifully illustrated children’s book sings with the art work that he may have created. There is much that is not known about Wu Daozi, which makes the book even more precious. Through the author and the artist, we can wonder what it must have been like for him to become such a renowned artist. I loved this book so much, I sent it to adult friends of mine who share my interest in Asian art. This is a children’s book meant to be shared with young and old alike.